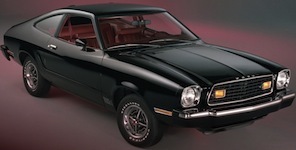 1976 The 1976 optional all-black sports group for the Mach 1 created The Shadow. Its features include: the Mach 1 options, black exterior, black or bright red interior, brushed aluminum instrument panel applique, black grille/window molding/windshield wiper arms, competition suspension, Traction-Lok differential axle, and extra cooling package. On an invoice, we see this listed as a Black Midnight option.